Dolphin Encounters - Pacific White Sided Dolphin, British Columbia. Few people have the opportunity of dolphin encounters, especially in the wild. To imagine these wild animals freely choosing to perform in front of you and race beside you is a wonderful unique experience. 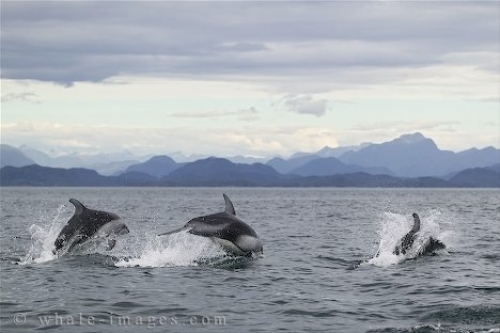 Dolphin encounters are frequent in the sheltered coastal waters between Northern Vancouver Island and the British Columbia mainland of Canada. Picture of the British Columbia Mountains and three dolphins jumping.